A Rosemount, MN teacher was suspended yesterday after growing backlash to her Tweet where she called for someone to assassinate newly confirmed Supreme Court Justice Brett Kavanaugh. This afternoon, Samantha Ness, formerly a special education teacher for the Alliance Education Center, resigned from her position. News of the Tweet spread like wildfire in Minnesota thanks to Minnesota Gun Rights, a ‘No Compromise’ gun rights group that went to their 125,000 plus Facebook page and urged their members to call the school and demand Ness’ termination. The post spread quickly, being shared over 3,000 times before being removed from the page by Facebook. MGR’s Political Director, Benjamin Dorr, told SecondAmendmentPolitics.com that their page was inundated with gun-grabbers who reported the post to Facebook. These people are beneath derision. While Attorney General candidate Keith Ellison has beaten women black and blue he has the full support of the leftist DFL machine in Minnesota. When a MN teacher calls for the assassination of a Supreme Court Justice and we call her out for that, then they have moral indignation. Such a joke. While these people found a friendly audience with Facebook who removed the post, our members are pleased that Ness was forced out of her job due to the pressure. A win is a win. 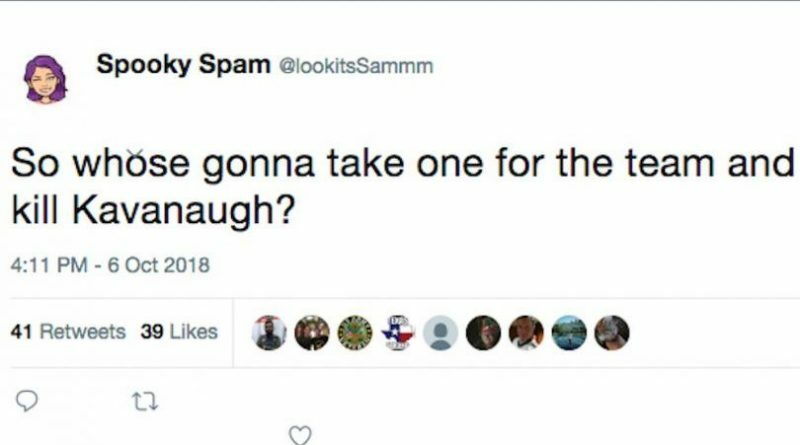 We find it absolutely outrageous that a taxpayer funded teacher can call for the assassination of anyone, let alone a Supreme Court Justice, and keep her job. While the same unhinged leftists that are backing the woman-beating Keith Ellison for AG will try to claim this is ‘protected speech,’ the members of Minnesota Gun Rights are demanding that Superintendent Mark Zuzek terminate Ness immediately or face immense public backlash. And to the hundreds of gun-hating leftists that are hammering our Facebook page demanding that we retract the post, know that it will be a cold day in hell before we surrender an inch. While Facebook may have removed this post, it’s clear that the members of Minnesota Gun Rights, and conservatives nationwide, are riled up right now and looking for a political fight. ← Minnesota Gun Rights Group Calls Out Teacher for Urging Murder of Judge Kavanaugh!